WASHINGTON HEIGHTS — It’s long been possible to get a good bowl of sancocho or to sip a morir soñando in Upper Manhattan — but alongside these Dominican classics, Mexican dishes have begun to appear. 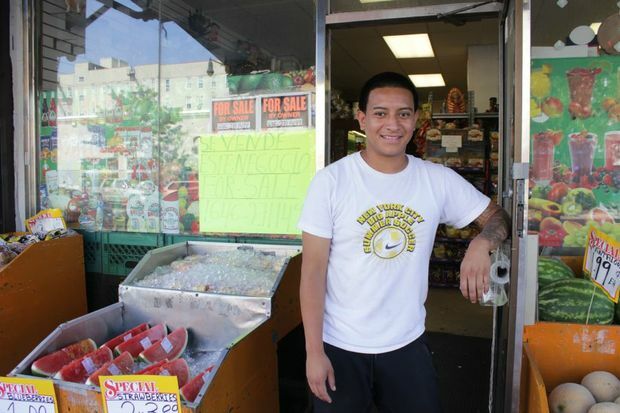 Whether it’s tacos al pastor from El Pitallito Restaurant on Broadway near West 161st Street or a glass of horchata from one of many local street vendors, these options are some of the most visible signs of Northern Manhattan’s growing Mexican community. The Mexicans population in Washington Heights, Inwood and Marble Hill more than doubled from 5,054 people during the 2000 census to about 11,214, according to the most recent data from the American Community Survey, which provides a five-year estimate based on data collected between 2009 and 2013. Aguirre said that his group moved to its current location at West 155th Street and Broadway two years ago after failing to find a space in East Harlem. There is an established Mexican community there, but Aguirre found his organization couldn't afford the neighborhood. So, a local artist who has worked with Mano a Mano suggested that he look farther north. “In the beginning we thought it was not going to be a very good decision, because when you think of Washington Heights, you think Dominicans, not so much the Mexican community,” Aguirre said. A trip to the neighborhood convinced him that the population was large enough for Washington Heights to be a viable location. Since making the move, Aguirre said that the community has grown even more. The growth in Washington Heights mirrors a citywide trend. Between 2000 and 2010, the Mexican population in New York City jumped 83 percent — from 187,259 to 342,699, according to a report from CUNY’s Center for Latin American, Caribbean and Latino Studies based on census data. If the population continues to grow at the same rate, Mexicans will become the largest Latino national group in the New York City metropolitan area sometime in the early 2020s, the report said. Uptown, the area that has seen the most growth is the southern part of Washington Heights, roughly between 155th and 170th streets, the population data shows. About 1,753 people living in this section of the neighborhood identified as Mexican, according to the 2000 census. That number increased nearly four-fold to 6,892 by 2013, according to the American Community Survey. City Councilman Mark Levine, who represents an area that includes Washington Heights between West 155th to West 165th Streets, said the change is most noticeable when visiting local schools and churches. “It’s become a very visible presence,” Levine said of the Mexican community. Levine speculated that some of the population growth could be due to people moving from other areas of Manhattan. While there are Mexican communities in the Bronx, Queens and Brooklyn, Levine noted that Washington Heights could be more appealing because it provides commuters easier access to jobs throughout Manhattan. Laura Lopez, who was born in Mexico and has lived in the West 180s for seven years, agreed, noting that there are also plenty of jobs within the neighborhood. “People move here for the jobs,” she said in Spanish. Lopez works at Taqueíra Los Jarritos on Nagle Avenue, a Mexican-owned café that opened two years ago. Although she speaks limited English, that hasn’t hindered her ability to work in a largely Spanish-speaking neighborhood due to the dominant Dominican population. As the Mexican population grows, more businesses open to serve it, creating even more jobs for members of the community. At El Pitallito, another new restaurant, manager Jonny Flores said the clientele hails largely from the nearby Mexican community. Yordi Moran, 21, who is Mexican and has lived in Inwood for 11 years, said he has also noticed the increase. For him, there is an even simpler explanation for the growth. “The parents had their kids, and now the kids are grown and having kids, so the community is growing,” he said. Either way, Levine said that the Mexican community has brought positive changes to the neighborhood.